Orthodontics (also referred to as dentofacial orthopedics) is a specialized form of dentistry that focuses on the diagnosis, prevention, and treatment of dental and facial abnormalities. Dr. Fermanis has received three years of additional training after dental school. Orthodontists not only straighten teeth; they also help correct skeletal discrepancies of the jaws and improve the function of your smile. If you want to improve the look and feel of your smile, then any age can be a great time to see the orthodontist. The American Association of Orthodontists recommends that children first visit an orthodontist around the age of seven; however, orthodontic treatment is not exclusive to children and teens. About one in every five orthodontic patients is over the age of 21. 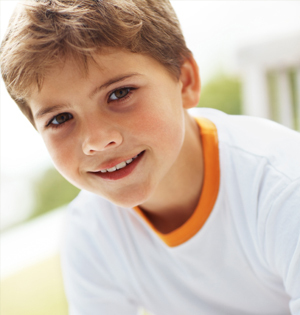 Whether you’re considering treatment for yourself or for a child, any time is a good time to visit the orthodontist. What does it mean if my child needs Phase I treatment? Phase I treatment (also called interceptive orthodontics) is usually performed between the ages of 7 and 10, before all the permanent teeth have erupted, and lasts from six to 12 months. The benefit of Phase I treatment is that it allows the doctor to identify potential problems in the teeth and jaws before the child gets older, when these problems are more difficult to correct. A retainer holds or retains your teeth in their final position after your braces come off. There are several types of retainers, but in most cases retainers can”t move teeth that much. Initially, when active treatment is complete, we ask that you use your retainer day and night. Dr. Fermanis will let you know when you can start using it during the night time only. How can I take care of my teeth if I’m wearing braces? Continue to visit your regular dentist for cleanings at least every 6 months. #1 Rule: Wear your retainer as directed by the doctor. Then you’re less likely to lose it or break it. Keep your retainer clean, too, by brushing it gently with a toothbrush and toothpaste. You may also soak it in denture cleaner as instructed by Dr. Fermanis. Do not put your retainer in boiling water or in the dishwasher, because It will melt. Keep your retainer away from family pets. It’s an expensive chew-toy! The above rules also apply to patients who get Invisalign treatment. The amount of time spent in braces will vary, depending on the individual patient, because every smile responds differently to treatment. Treatment times can take anywhere between six and 30 months, but most standard treatments take about 22 months. Some patients experience discomfort when they first get braces because their teeth, gums, and cheeks will have to get used to the new braces. It is also normal for the teeth to feel sore for three to seven days after most orthodontic appointments. It helps to avoid hard food until the soreness disappears. An over-the-counter pain reliever such as Motrin, Tylenol, or Advil may also help. With braces, you should brush your teeth at least three times a day to keep your teeth, gums, and mouth healthy and clean. Brushing regularly will help remove any food that may be caught between the braces. You should also floss daily to get between your braces where your brush isn’t able to reach. We can show you how to brush and floss properly once your braces are placed. Pay special attention to the gumline too. Poor hygiene can result in puffy gums or permanent white spots called “decalcifications” on the tooth surface. Yes! In fact, it’s even more important that patients receiving orthodontic treatment visit their dentist regularly. With braces, food may be caught in places that your toothbrush can’t reach. This causes bacteria to build up that can lead to cavities, gingivitis, and gum disease. Dr. Fermanis will work closely with your dentist to make sure your teeth stay clean and healthy while wearing braces. Do I have to miss school or work for my appointments? because these procedures take about 1 to 1.5 hours. We try to keep our after-school appointments for progress checkups, which require shorter appointment times (usually 10-20 minutes). We do not want your child to miss school unnecessarily, so we’ll try to keep longer appointments to a minimum. Frequent missed appointments and broken braces, however, may require patients to come in during the school/work day. Playing an instrument or a contact sport may require some adjustment when you first get your braces, but wearing braces will not stop you from participating in any of your school activities. If you play a contact sport, it is recommended that you wear a mouthguard to protect your braces or appliance. There are special mouthguards made for braces; do not use the “boil-and-bite” ones. Simply call our practice! Our front desk staff will be happy to help schedule your next appointment at your convenience. If you are a new patient or have been referred to our practice, please let us know and we will provide you with all the information you need.